Know about the important aspects of spiritual and cultural centre of Sikh religion ‘Amritsar’ through Indiator’s Amritsar tour package from Delhi. The 3 days Amritsar sightseeing tour package shows you highlights of the city: The Golden Temple (along with retiring procession of Guruji), Jallianwala Bagh and Wagah-Attari border Flag Lowering ceremony of India & Pakistan. Get surprised by the immaculate use of gold in the making of Golden Temple. See the wave of patriotism at Wagah-Attari Border. Capture the well lit night view of scintillating Golden Temple. Discover the surprising facts about Sikh religion. Witness the reminiscent of fateful Baisakhi (in 1919) leading to several deaths in Jallianwala Bagh. You will be picked up from your hotel in Delhi and transferred to Delhi airport. Fly to Amritsar city and get dropped at the booked hotel in Amritsar by our chauffeur driven car. 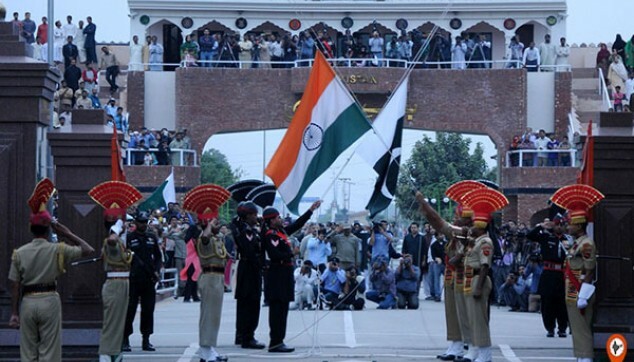 Get ready at 3 PM to leave for Wagah-Attari border (India & Pakistan) for witnessing Flag lowering ceremony. It is located 30 kms away from Amritsar taking around 45 minutes by road. Flag lowering (aka Beating Retreating) ceremony is a military practice conducted on daily basis by Indian Border Security Force & Pakistan Rangers. Enjoy the 45 minutes long fun event from VIP gallery (only permissible for foreign nationals) seated close to the border. See the wave of patriotism in the people cheering the ceremony filled with dancelike manoeuvres. After watching an exciting show, return to the hotel. Enjoy the complimentary breakfast and leave for sightseeing at 9 AM with our representative. Begin the day with holy visit to most sacred place of Sikhs ‘The Golden Temple’ located in the heart of the city. Enter The Golden Temple by bathing feet in mini pool at the entrance. As you walk inside, a huge water moat surrounding the gold-made temple will catch your fancy. The giant pool is called ‘Amrit Sarovar’ meaning pool of nectar. The name of the city Amritsar is derived from this pool and is deemed highly sacred; people take a holy dip in it. It is necessary to keep your head covered inside the temple. Path to the temple from the concourse is 10 mins walk. The sanctum contains the holy book of Sikh ‘Guru Grantha Sahib’ holding utmost religious importance. It is usually kept at Akal Takht from where it is brought to the temple daily at 3.30 AM and taken back at 10 PM. We will come back later to see the retiring ceremony of the holy book at night. 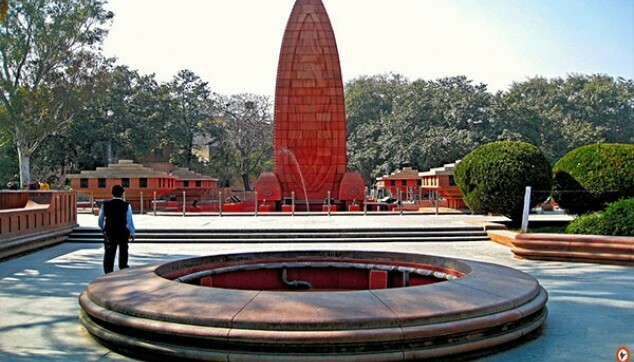 Continue the tour visiting ‘Jallianwala Bagh’ which is a 5 minutes short walk from the temple. It is memorial to the people who died in the open firing conducted by British military commander, General Dyer in 1919. The cavities caused by bullets on the walls will remind you of the gruesome event. Have a look at the martyr well where many people lost their lives drowning in an attempt to save themselves from the shooting. Listen to the interesting detailed story from the accompanying guide. Afterwards, move forward to explore the nearby local markets followed by famous Hall Bazaar. Pick some keepsakes for your loved ones. Then around 9 pm we will head back to the Golden Temple to attend the retiring ceremony of Guru Grantha Sahib. ‘The Guru Grantha Sahib’ book is kept at Akal Takht, built opposite Harminder Sahib by 6th Guru ‘Hargobind Sahib Ji’. Akal Takht is the foremost Takht of all 5 Takhts in Sikh religion. It is 5 storeyed structure made of marble and gold leafed dome. Watch as the holy procession comes along with the sacred book chanting hymns Gurbani Kirtan and take Karah Prasad. After a soul-stirring evening get back to the hotel and spend an overnight stay. Have breakfast and then hop in the car waiting for you to drop at the Amritsar airport. Board the flight back to Delhi, our driver will transfer you safely at your hotel in Delhi. 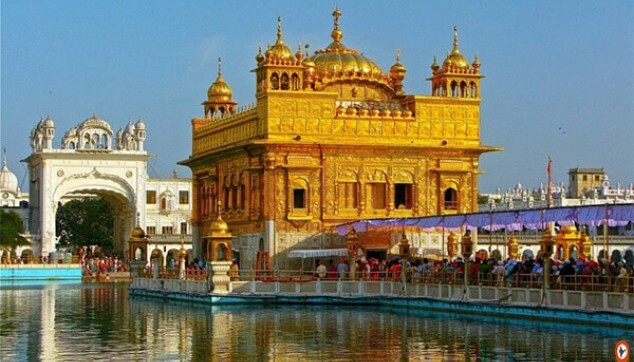 Your Amritsar Golden Temple tour package will hereby terminate. 2 Night hotel accommodation at HJ Clarks Inn Or Similar category hotel at Amritsar.